2Wheel Dynoworks Black Friday Sale! Attention riders! To show how thankful we are for our supporters and fan base, 2 Wheel DynoWorks is having another BlackFriday sale special!! Specific ECU flashes, listed below, are on special for $264.99, including 2-day return shipping to the continental US. That's right! This is our lowest price ever!! Just $264.99 on all available flashes!! This includes your full custom built fuel maps, custom ignition maps, full custom throttle maps, full custom secondary throttle maps, removed restrictions, removal of speed limiter(where applicable), lower fan temperatures(when available), fuel cut removal, Autpblipper (when available) quickshifter activation (when available), and more! ECU flash must be paid for by Midnight on Sunday 11/26/17. Payment can be made with credit card over the phone, or through PayPal to 2wheeldynoworks@gmail.com. ECU's can be shipped in at your convenience. All orders must include contact information, return shipping address, year, make, & model of your bike, as well as a complete list of modifications. If you have any specific questions, please email us before shipping your ECU to make sure they are all answered properly. If you are local, FREE removal and installation of ECUs for flashing! Thanks again for the great deal Nels. Can't wait to get the new flash and exhaust installed. Happy Thanksgiving! Thanks for the Awesome hookup. This deal is too good to pass up! Order Placed! Awesome deal there. I’m planning on getting me a 2018 mt10 which has updated ecu tuning from yamaha. How long do you think it will be before you’ll have a flash for the 18’s? Awwww man, just placed my order last week. Kirk took good care of me and his service is truly refreshing, cant put a price on that from a customer standpoint! Take advantage everyone, saving a couple bucks here and there by looking for the best deal possible isn't worth a couple bucks saved vs. the service you get through 2WDW. Even better with the sale you'll be saving by dealing with the crew at 2WDW! And i am not a paid spokesman..lol. We don't have an idea on the 2018 just yet. We will keep in touch with our software providers and hope to have an update when we see the bike hit the market. Sweet! No brainer! I'm all over this deal!! Bump, this sale is still going! 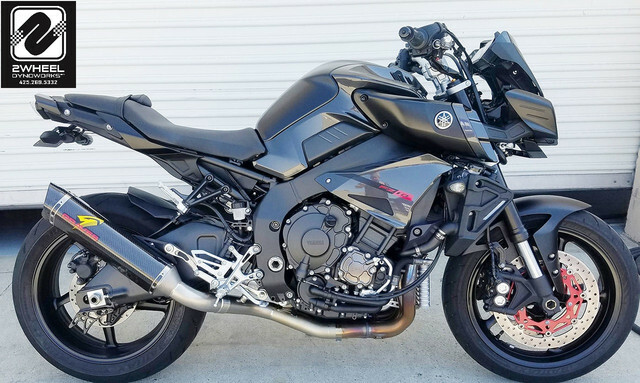 your stock fz10 makes 133 hp. Nels tunes get you at 147 -155 hp ! This is the best tune by far for the FZ-10 . Send in your ecu on monday, have it back by Friday or sooner! They don't do discounts very often, snooze you lose! Just placed my order!! Stoked! Thanks for the smoking great deal! Payment made on Friday. Shipping out today.